In the lead up to the United Nations Climate Conference, COP23, in Bonn Germany in November, the Australian ambassador for climate is touring Pacific Island nations touting Australia’s climate action credentials. Pacific Civil society have called out the ambassador Patrick Suckling, and Australia’s climate policies, with a new award that highlights Australia’s ongoing promotion of fossil fuels. 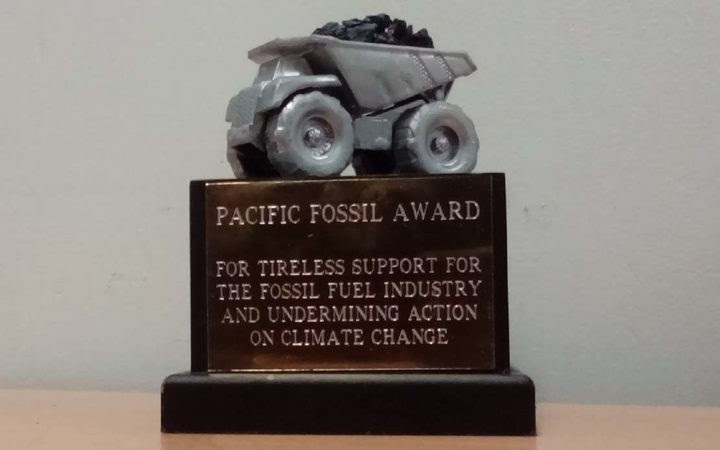 The inaugural ‘Pacific Fossil Award’, was given to Australia for repeated efforts to convince Pacific island countries that Australia is serious about tackling climate change, even while making the problem worse by expanding coal exports, and promoting the use of coal abroad. The award is intended to call out countries that are not doing their fair share to move away from fossil fuels and to tackle climate change. It was established by Pacific Islands Climate Action Network (PICAN). The Australian ambassador for the Environment, Patrick Suckling, was visiting Fiji as part of a whistle-stop tour of Pacific Island Nations, including stopping off at the Solomon Islands, Vanuatu, Kiribati, Fiji and Tonga as part of the tour. According to PICAN, while Suckling was visiting the low-lying atoll nation of Kiribati, the Ambassador suggested “Australia’s stance on climate is very strong. We have one of the most ambitious targets in the G20”. However this contradicts independent analysis by Climate Transparency that rates Australia on worst among G20 countries for its efforts to tackle climate change across numerous indices. (Read the Australia Country Profile (PDF)). According to PICAN, the claim that Australia has set ambitious targets to reduce emissions has been also been rejected by island governments. PICAN COP23 Project Officer Genevieve Jiva said in a statement that pretending to tackle climate change while doing little to reduce emissions at home, and increasing coal exports abroad, was ‘an attempt to pull the wool over our eyes’. She said the decision to grant the award to Australia was not taken lightly. “Time and again, island leaders have explained that climate change is the single greatest threat to the livelihoods, security and well-being of our peoples,” said Jiva. “Australia is the largest and wealthiest member of the Pacific Islands Forum. PICAN highlighted that if the Adani Carmichael coal mine in the Galilee Basin goes ahead, it is so large that annual emissions that will be created when coal from the mine is burned will be approximately three times greater than the emissions from all 22 Pacific island countries and territories put together. Fiji will assume presidency of the United Nations Framework Convention on Climate Change (UNFCCC) Conference of Parties (COP23) in Bonn later this year. Fiji’s Prime Minister Voreqe Bainimarama has previously called on the Australian Prime Minister Malcolm Turnbull to ‘impose a moratorium on the development of further reserves of Australian coal’. The media statement, is available from the Vanuatu Independent News Magazine. Entry filed under: campaigns, climate change info, coal export, news, Pacific Islands. Tags: award, COP23, Pacific, Patrick Suckling, PICAN.